We were looking forward to this trip after a pretty hectic week. A relatively under-the-radar beach destination in the western seaboard of Pangasinan on a weekday would surely bring very few visitors. And during the off-peak tourist season to boot. Along with three other friends, we had everything geared up for a two-night stay and were looking forward to enjoying moments of solitude underneath the shade of coconut palms. Or so we thought. Arriving at Cabongaoan (Cabo) Beach in Burgos, Pangasinan, after a long drive over 4 provinces and stretches of still unpaved roads in the interior, we were disappointed to discover that 5 other (and much larger) groups of visitors were thinking about the same thing. And they had actually beaten us to our destination. Loud music, ear-piercing screams and animated conversations magnified our worries that we wouldn’t be getting the peaceful retreat that we came here for. But it was too late to turn back now with evening fast approaching and the prospect of driving over rough, unlighted roads at night a little bit unnerving. No choice but to dig in and sit tight. It was nearing sunset when we arrived at Cabo Beach, just in time for the golden hour and, afterwards, striking sunset views. Surprisingly it was quiet that night with most visitors retiring into their cottages after dinner. No partying. No late night drinking sessions. Except for the excited banter of some youngsters taking a bath after a night swim, the evening passed by peacefully. Perhaps we could have our quiet retreat here after all. 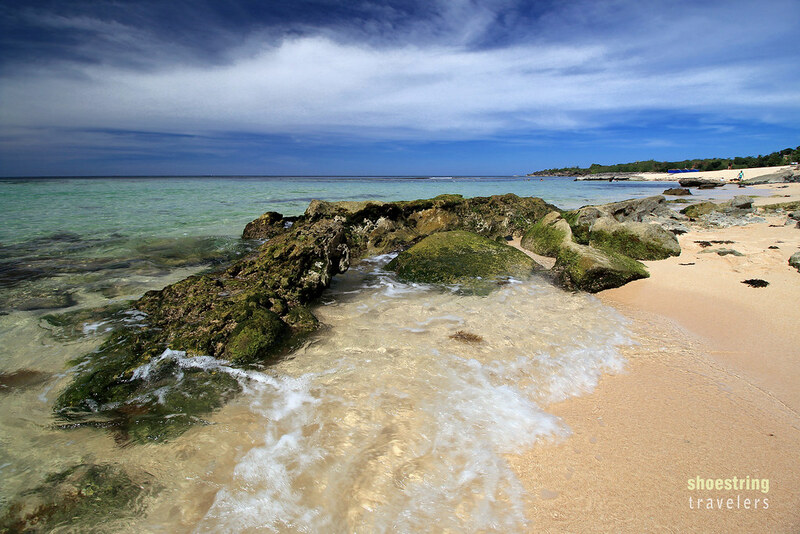 Morning revealed the comeliness of Cabo Beach, a long, golden-white sandy beach with crystal-clear turquoise waters. Our resort – Roven’s Place – is located in the middle of Cabongaoan’s long sandy expanse, marked by a line of bent coconut palms. The latter is perhaps Cabo’s unique and iconic feature. Soon people in our group were running through the soft, powdery sand straight into the shallow waters. 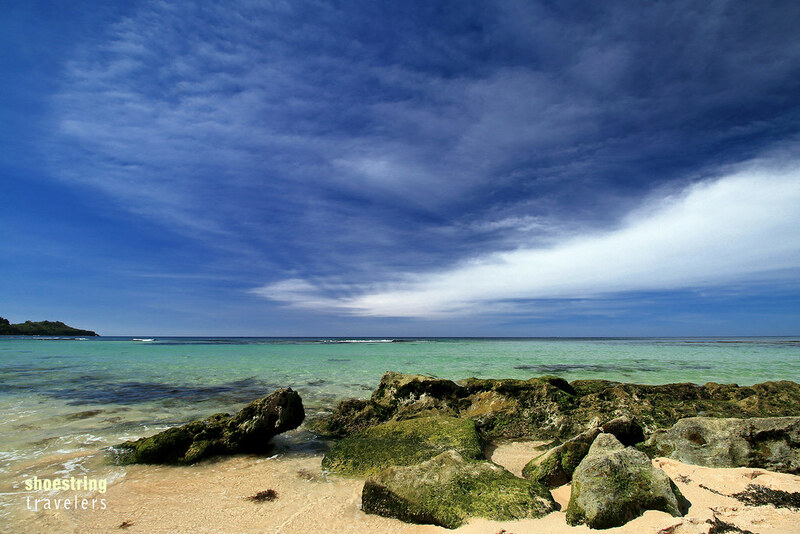 An interesting feature of the beach section in front of the resort is the presence of what looks like a natural breakwater in the form of a coral rock embankment a hundred meters from shore. This rock embankment acts as a protection against strong waves. One can even walk all the way to this natural breakwater, which is easily visible at low tide. Cabo Beach is not all fine sand, however. There are portions containing interesting rock formations both in the northern and southern sections of the beach. Some of us did an early morning hike to the southern end of Cabo near the small lighthouse perched on a higher elevation overlooking the beach (unfortunately they couldn’t locate any path going to the lighthouse). Here rock formations of various shapes and sizes bore mute testimony to the ruggedness of Cabo Beach. Boats from a fishing community at the southern section of Cabongaoan Beach; the beach is still quite clean at this section. There are few houses along Cabo Beach but there is a small fishing community at the northern section just past Cabo Beach Resort. A cluster of small, colorful fishing boats mark the location of this tiny community. Leo got to this portion alone and had his moments of serenity just strolling lazily along this beach section. 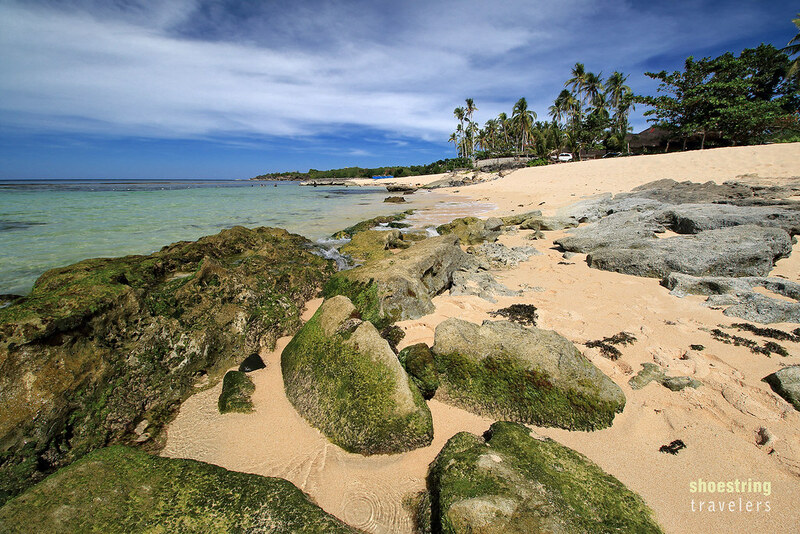 There are also several rock formations scattered amidst the fine golden white sand here, perfect for photo opps. Cabo Beach is large enough so that it is possible to hike a little farther away from your resort to discover a nice, quiet spot far from the crowd. The most endearing thing about Cabo Beach, besides its shear natural beauty, is the laid-back, non-touristy feel of the place. Our resort has very basic amenities such as a manually-operated deep well pump instead of running water and communal comfort rooms. Together with the beach front however, it is clean and well-maintained. Even pumping water from the well contributed to the feel of an imperturbable stay. Best of all we had a lot of time to talk and bond with old friends, something we have looked forward to on this trip. Via public transpo: If you’re commuting from Metro Manila, take an Alaminos or Bolinao, Pangasinan-bound bus. Get off at Alaminos town and ride a bus bound for Sta. Cruz, Zambales. Get off at Burgos town proper and rent a tricycle for Cabongaoan Beach. Be prepared for a rough ride as some parts of the road are still unpaved. Via private vehicle: Waze or Google Maps will get you to take the North Luzon Expressway (NLEX), then to the Subic-Clark-Tarlac Expressway (SCTEX) and exit either at Tarlac City or Paniqui Tarlac, before proceeding on to Alaminos. Since that drive will take us through smaller interior roads, we opted to take the exit at Urdaneta, then drove through Dagupan and Lingayen before reaching Alaminos (we also wanted to have a bangus lunch at Dagupan). At Alaminos take the bypass road to Zambales and drive to Burgos town. From the town proper turn right on Bustria or Guiang Street near the elementary school. Keep driving until you pass Barangay Concordia and you see the huge truck tire and a marker pointing the way to Tambobong Beach in Dasol. The way to Tambobong Beach is to the left at this point, while the road to Cabongaoan Beach is to the right. The road up to this point is paved (although narrow at some sections due to half of the roadway being repaired) except for a long gravelly stretch after Concordia on the way to the truck tire marker. There are small sections of the road to Cabo Beach from the truck tire marker that are rough (concreted sections that lost its wearing surface) but the road as a whole isn’t really that bad. It’s a bit narrow, though and we once had to backtrack to find a wider section of the road to park the car temporarily when we met a truck headed our way. Estimated total driving time from the Balintawak terminus of the NLEX in Metro Manila (excluding stopovers) is 5.5 to 6 hours. As mentioned earlier we stayed at Roven’s Place (named after owners Ronald and Venus Burlezza). They have native-style cottages good for 6 and 12-15 people. We stayed at the 6-person cottage and paid P2000 for an overnight stay. None of the cottages have air conditioning (only electric fans) but it was cool during the evenings; we even had to turn off the fan at one point since it got too cold. Summers would be a different story, however. Visitors also have the option of pitching tents; we saw a few of them near the beach and right under the bent palms. Roven’s only has communal comfort rooms and bath rooms but the owners keep them clean and supplied with water. We mentioned earlier that there is no running water but there is a deep well pump. Despite the basic amenities, the owners keep their resort clean; Ronald and some of his people regularly remove debris that get washed ashore early in the morning so the beach remains immaculately clean. The resort does not have a restaurant and you will have to bring your own food. Ronald and Venus will provide you with cooking utensils; they provided a charcoal-fired clay stove for us. They also have a store nearby where you can buy basic commodities. Their contact numbers are 0927-9957606 and 0906107-8860. There are other resorts nearby including Cabo Beach Resort next door (which has air conditioned rooms with private toilet and bath). Unfortunately we could not locate the resort manager or even a caretaker for more information. 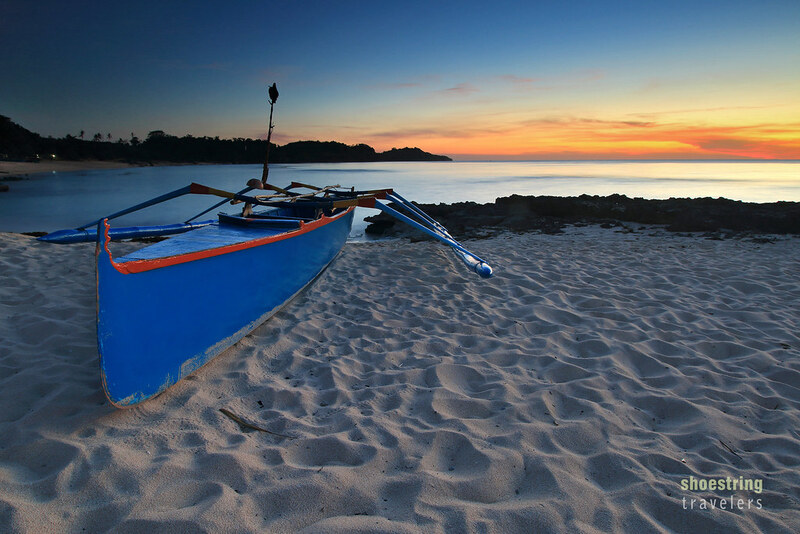 Posted in Pangasinan, Travel PhilippinesTagged beach, Burgos, outdoor, Pangasinan, philippines, sunsetBookmark the permalink. Thanks Ricci! Others have gone before 🙂 We usually look for white sand beaches on Google Maps then search for other blogs that feature them. Beautiful photos! Makes me wish I was there right now! You’re welcome Kate. Pangasinan does have a lot of not-so-well-known but outstanding beaches esp. along the western coast (at Dasol, Burgos, etc.). However they are getting more popular these days as we found out during our visit there. 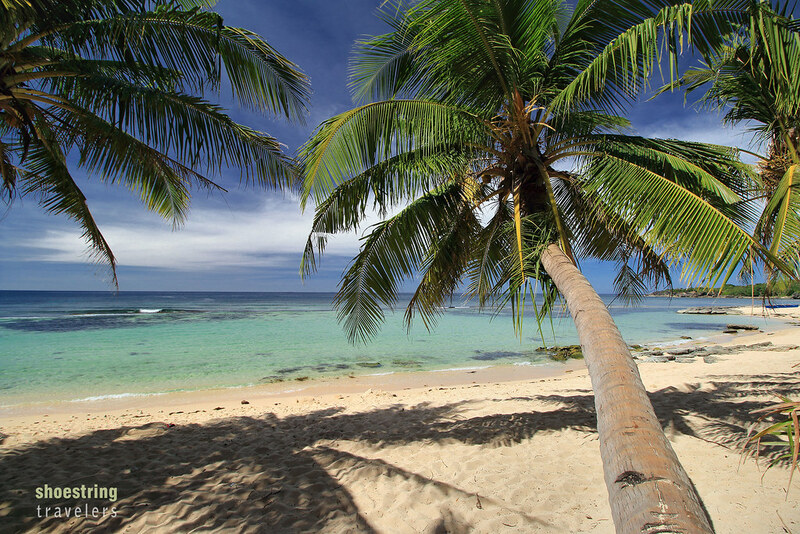 We think Cabongaoan is one of the best beaches in Pangasinan. Enjoy your tour!